Investing in world stock mutual fund is important for investor to participate in global expansion. 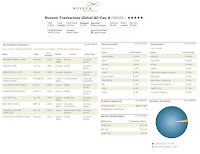 Some of the best world stock mutual funds are: Nuveen Tradewinds Global All-Cap fund, Royce Global Select fund, Royce Global Value fund, etc. Since 2000, big or small companies has prepared for globalization. Over the years, business operations and investment are moving throughout this world. International stock markets have managed to hold greater prominence and account for half of the world’s market capitalization. To invest in these international stocks, investors can choose several ways such as individual stock, mutual fund, closed end fund, and exchange traded fund. Selecting individual companies stocks may be difficult for regular investors. Choosing mutual fund, investor can get diversification and reduce risk. 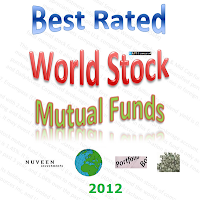 One of the popular international stock mutual fund categories is world stock fund. This world stock mutual fund invests in U.S. and Non-U.S. companies stocks. 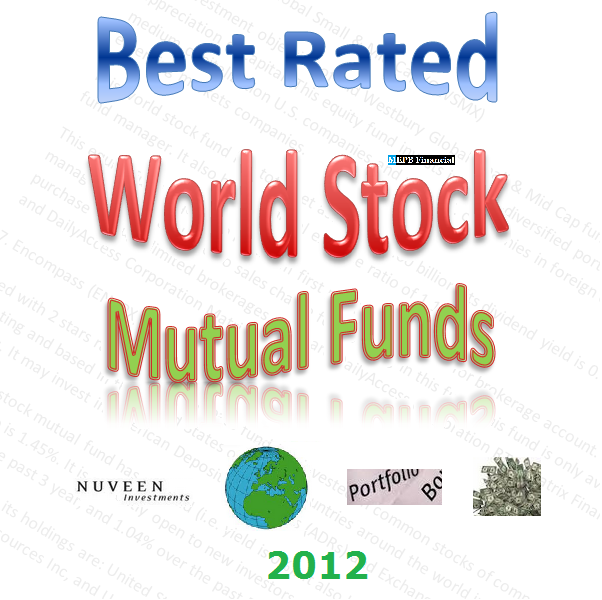 These world stock mutual funds are ranked based on its long term performance. You may find other fund review information such as fund management, dividend yield, sales load, expense ratio fee, top holding, top sectors, etc. 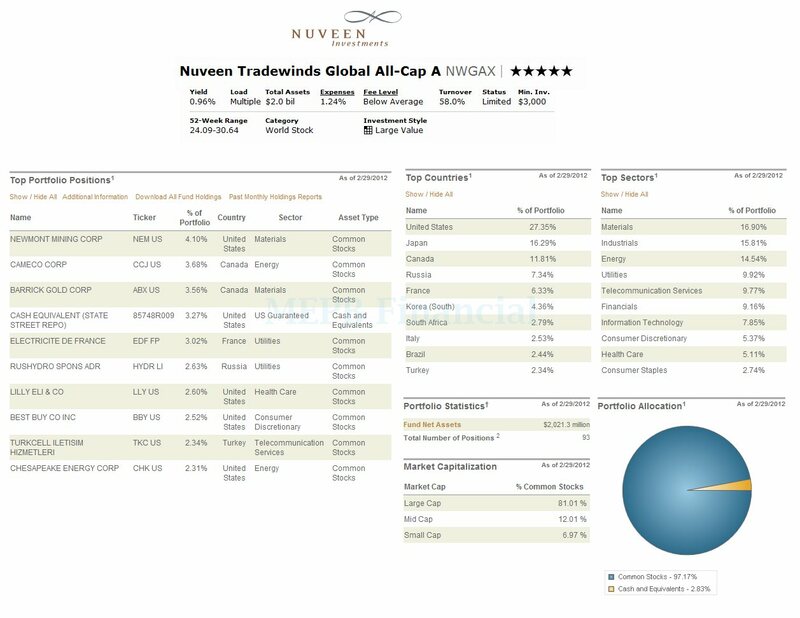 The Nuveen Tradewinds Global All-Cap fund typically invests majority of net assets in equity securities of U.S. and non-U.S. companies. It may invest some of net assets (<25%) in stocks of companies located in emerging markets. It invests in equity securities of companies located in at least 3 countries, including the United States. This world stock mutual fund has total net assets of $2.02 billion. It has YTD return of 10.30%. Morningstar has ranked 5-star rating for its performance. This stock fund is currently managed by David B. Iben. The minimum initial investment is $3.000 for brokerage account. It has a management fee of 0.25% and a maximum sales charge of 5.75%. The fund can be bought from 78 brokerages. As of February 2012, the top 6 stocks in its holdings are Newmont Mining Corporate (4.10%), Cameco Corporation (3.68%), Barrick Gold Corp (3.56%), Cash Equivalent-State Street Repo (3.27%), Electricite de France (3.02%) and Rushydro Spons ADR (2.63%). The investment objective of Royce Global Select fund is to provide long-term capital growth. This mutual fund utilizes its assets to purchase equity securities of mid- and small-cap companies, and micro-cap companies, from >3 different countries including the United States. It may use short position and invest in stocks of companies located in developing countries. David Whitney Nadel is the current fund manager. It has 1.35% dividend yield. The latest dividend was distributed to its investor on December 15, 2011 in the amount of $0.25. This world stock mutual fund has annual expense ratio of 0.98%. There is no management fee and no sales charge for investing in it. This fund is offered by 19 brokerages only. Its 3-year annualized return is 28.17%. The top 5 holdings as of February 2012 are Semperit AG Holdings (3.1%), Mayr-Melnhof Karton (2.9%), Jupiter Fund Management (2.8%), Value Partners Group (2.8%) and Lamprell (2.7%). The ING Global Value Choice fund utilizes its net assets to purchase stocks of companies in several different countries, including the United States. It may invest in common and preferred stocks, depositary receipts, derivatives and convertible securities. This world stock fund may some of its assets in emerging securities markets companies. Morningstar has rated this equity fund with 5-stars. 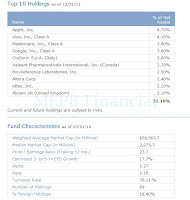 The fund’s annual holdings turnover rate as of March 13, 2012 is 67.00%. The annual expense ratio of this ING fund is 1.42%. The minimum initial investment for investing in this fund is $1.000. The management fee is 0.25%. The best 1-year total return out of 13 years of positive return was achieved in 1999 with 83.52%. The top 5 sectors as of February 2012 are Materials (16.23%), Industrials (16.05%), Energy (15.45%), Utilities (10.46%) and Financials (10.43%). The Royce Global Value fund’s objective is to provide long-term capital growth. This international stock mutual fund invests its assets mainly in the equity securities of both U.S. and non-U.S. undervalued companies. These companies typically have market capitalizations up to $5 billion. This best mutual fund has annual expense ratio of 1.69% which is a bit higher than the average in the World Stock category (1.45%). 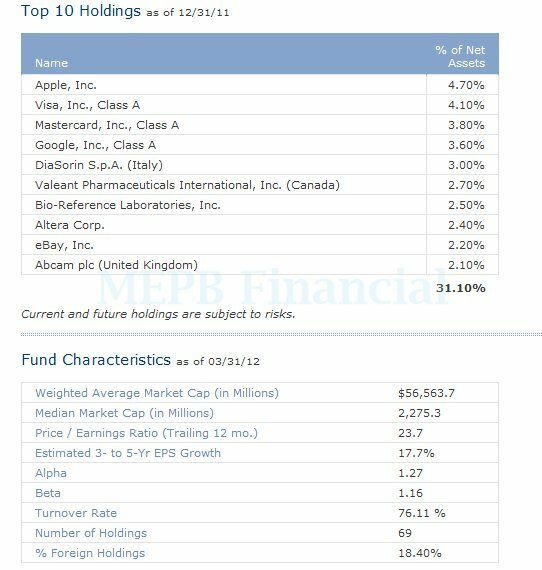 The annual holdings turnover as of March 12, 2012 is 77.00%. W. Whitney George and David Nadel have been managing this international stock mutual fund since its inception in December 2006. The fund has 5-year annualized return of 6.68%. The fund has just distributed its dividend on December 2011 to its investor ($0.07). 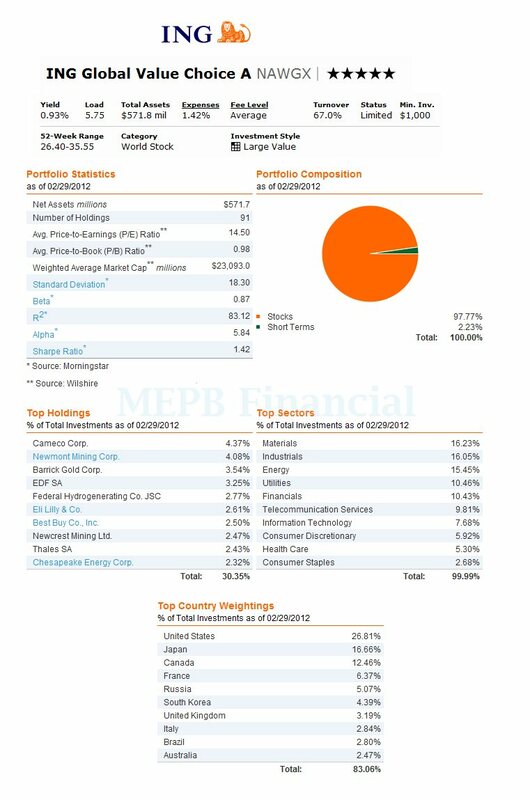 The top 5 stocks in its holdings as of February 2012 are Value Partners Group (3.4%), Semperit AG Holding (3.2%), Mayr-Melnhof Karton (3.0%), Jupiter Fund Management (2.9%), etc. The top country diversification is United States (11.2%) and Canada (10.3%). 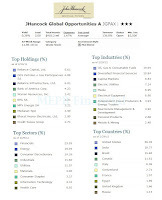 As part of stock fund, this JHancock Global Opportunities fund uses its assets to purchase a diversified portfolio consisting of global equity securities of any size. 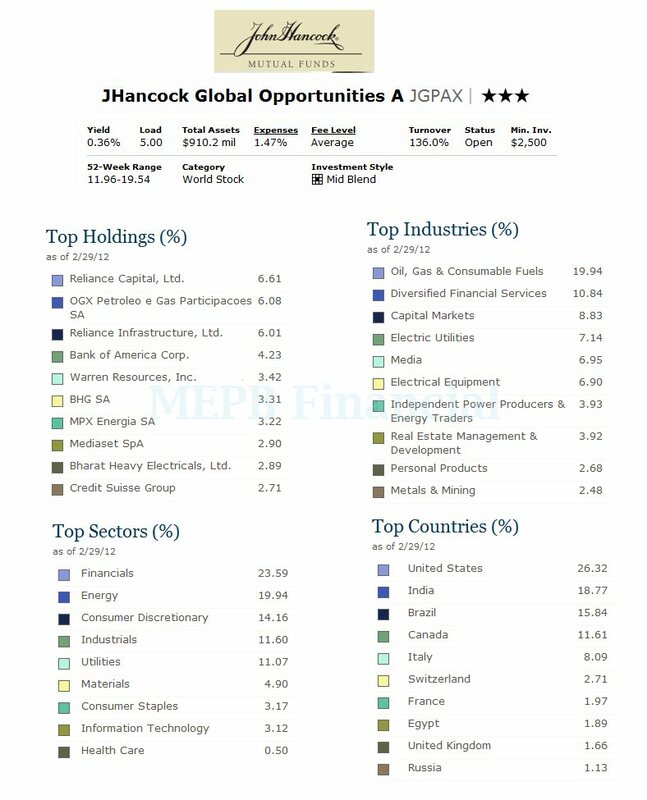 This JGPAX fund may invest some of assets in junk bonds or high yield bonds. This world stock mutual fund has an expense ratio of 1.47%. It is rated with 3-stars rating by Morningstar. The fund’s Year-To-Date return is 22.12%. Based on the load adjusted return, it has returned 30.17% over the past 3-year, and 5.26% over the past 5-year. Investors can open a brokerage account with minimum purchase of $2.500 through 80 brokerages. Some of these brokerages are JP Morgan, Merrill Lynch, E Trade Financial, Fidelity Retail Funds Network, etc. As of March 2012, the top 5 stocks in its assets are Reliance Capital Ltd (6.61%), OGX Petroleo e Gas Participacoes SA (6.08%), Reliance Infrastructure Ltd (6.01%), Bank of America Corp (4.23%) and Warren Resources Inc (3.42%). The investment objective of Old Westbury Global Small & Mid Cap fund is to seek long term appreciation of capital. This equity fund invests in a well-diversified portfolio of securities of small and medium capitalization U.S. companies and non-U.S. companies in foreign countries. It may invest in emerging markets companies. This world stock fund has total net assets of $5.00 billion. Its dividend yield is 0.60%. John Hall is the fund manager. It also has an annual expense ratio of 1.11%. This fund is rated with 4 stars rating. This equity fund requires a minimum first purchase of $1.000 for brokerage account. There is no management fee and also no sales charge for investing in this fund. This fund is only available for purchase through limited brokerages. They are DailyAccess Corporation RTC, Matrix Financial Solutions and DailyAccess Corporation Matrix. Rated with 2 stars rating, this Encompass fund has invested in common stocks of companies which are operating and based in the United States or foreign countries around the world including emerging markets. It may invest in American Depositary Receipts (ADRs) and Exchange Traded Funds (ETFs). This world stock mutual fund has no yield (i.e. yield is 0%). It also has $15.7 million total assets. The expense ratio is 1.45%. It is currently open to new investors. This top performing fund has returned 30.15% over the past 3 year, and 1.04% over the past 5 year. The top 5 stocks in its holdings are: United States Antimony Corporation, Avion Gold Corp, Avalon Rare Metals Inc, Brazil Resources Inc, and Uranium Energy Corporation. This Wasatch World Innovators fund uses its assets to buy stocks issued by companies in the developed countries including U.S. and in emerging markets. Morningstar has ranked this stock fund with 4 stars rating. It has $124 million assets. The expense ratio of 1.95% is higher than average category. There is no sales load. The fund’s investment style is mid growth. The Year-To-Date return is 15.17%. The fund has returned 21.12% over the past 3 year, 4.29% over the past 5 year, and 7.08% over the past decade. As part of no load mutual fund, this Oakmark Global Select fund has total net assets of $542 million. The fund’s objective is to achieve long term capital growth. This fund may invest in U.S. and non-U.S. companies. It is rated with 4 stars and silver rating by Morningstar. The fund’s co-managers are David G. Herro and William C. Nygren. The top 5 holdings include: Toyota Motor Corp, Adecco SA, Comcast Corp, Medtronic Inc, and Intel Corp. This Oppenheimer Global Opportunities fund has a sales load of 5.75%. The expense ratio is 1.20%. Morningstar has ranked this world stock fund with 4 stars and bronze rating.